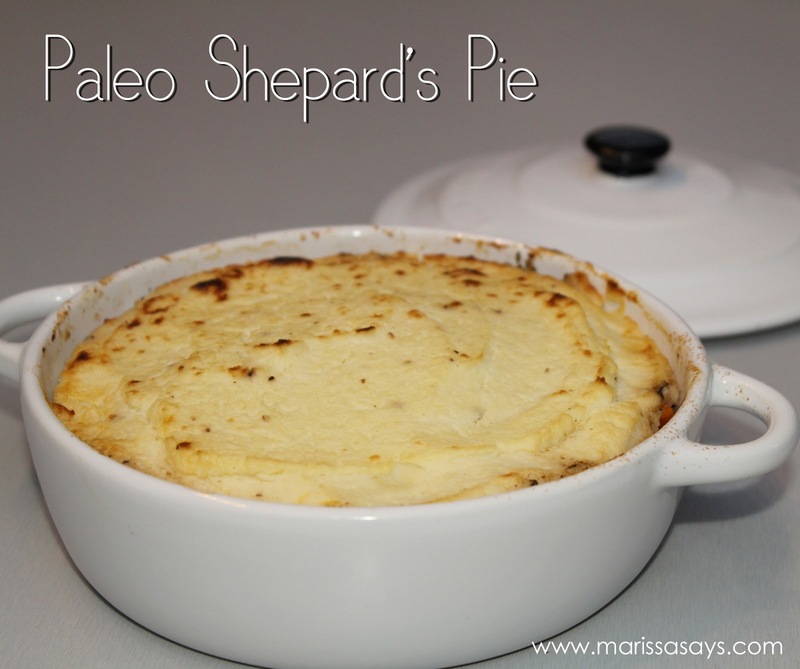 Shepard's pie is the ultimate comfort food, but if you go with the full-fat, extra glutenous recipe, you might end up feeling like a blob when you're finished (and that's not so comforting). This paleo version swaps out the traditional mashed potato topping for a cauliflower mash that makes it healthier, but still keeps it comforting! Also, it's chock full of veggies so you're sure to get your daily intake with a serving or two of this. Feel free to play around with the vegetables included and use whatever you have lying around! Cook bacon on med-high heat in a large shallow sauce pan (this is going to be the pan where all of your beef and veggies go so make sure it's big enough.) Once crispy remove bacon and drain on a paper towel. Leave bacon drippings in pan. Add 1 tablespoon of butter to the pan with bacon drippings, reduce heat to medium. Add onion, mushrooms, carrots, peppers, peas and garlic to the pan. Sauté until soft (approx. 5-10 minutes). When done transfer vegetables into a large mixing bowl. Add ground meat to the original pan. Sautee on medium heat until cooked through, stir to breakup meat (approx. 10 minutes). Season ground meat with salt, pepper, thyme, oregano and rosemary. Add vegetables back into pan with the cooked beef and stir to combine. Pour the broth and red wine evenly over the meat and vegetable mixture. Reduce heat to medium-low and let simmer for 5 minutes. While that is simmering - prepare cauliflower mash. Place steamed cauliflower in a large mixing bowl and add remaining butter and 1 tablespoon of olive oil. Puree with an immersion blender until smooth. Pour meat mixture into a large casserole dish. Spread mashed cauliflower over the meat and vegetable base. Bake, uncovered, for 30 minutes. If you want the top to get golden brown, turn on broiler for 5 minutes.